Hi everyone, how is your week going? Can you believe how fast November is coming to a close? I can’t! But at the same time, I also can’t wait for Saturday. I’m so eager to get going on the holiday decorating, but I’m being really good, letting the anticipation build. I’ve almost finished putting together my Holiday Planner. I only need a couple more printables to complete it. These printables were a PAIN to make. Actually, the making of them was pretty easy, PRINTING them was the pain. For whatever reason, one of the fonts I chose decided that it would let me print every letter but the letter “I” unless the “I” was immediately to the right of an “F”. Very weird. I tried everything I could think of, and finally decided to give up the fight and change the font. 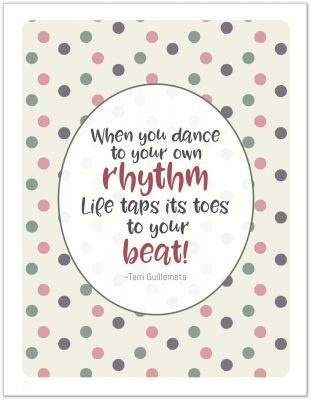 It was one of the strangest things I’ve come across yet with the printables. 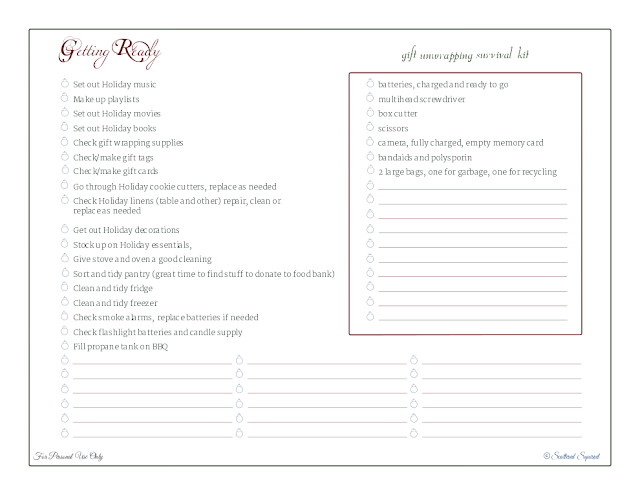 Anyway, after all that fiddling around, I’m here to share with you the final two printables for the holiday planner. The first one, I have to admit, probably should have been one of the first ones I made. I just didn’t think about it until the other day when I was going through list after list of stuff to do. I had one of those “Duuuh!” moments, and decided to compile all my little lists into one big list. What were the lists for, you ask? Ummm…. everything I need to do to get ready for the holidays. (I am hanging my head right now.) I couldn’t believe I didn’t think to make this before. Every year I do the same things to get ready for the holidays, and every year I write out a dozen new lists so I don’t forget. No more! Here is my Getting Ready checklist! It’s pretty straight forward, just a list of things I need to remember to do to get ready for the holidays. Because this is a “help me be prepared” list, I also included my checklist for our Gift Unwrapping Kit. I know that sounds weird, but every year we seem to need the same things, and every year I forget about them until they are needed and them I’m scrambling on Christmas morning. A couple of years ago we started corralling all the most needed things together and it made for such a calmer morning that I don’t think I could ever go back. As the years go by, I add to the list of things we need on hand, like bandaids and polysporin. I don’t know about in your home, but in ours, someone usually ends up cutting fingers on cardboard boxes (that would mainly be me!) getting paper cuts from the wrapping paper (…again, that’s mainly me) or slicing open a finger because she’s rushing through cutting up potatoes or something else … ok, so it’s me! I’m a clutz, bandaids and polysporin are a must to have on hand! And if you’re wondering about some of those items on the end of the list, like checking flashlight batteries and filling the propane tank, let me explain. We used to live far up in northern BC. Power outages were not uncommon, especially in the winter. You just never know when you might need to fire up the grill and move the bird outdoors to finish cooking. Just because we’re now in southern BC doesn’t mean I need to be any less prepared. The last printable was actually inspired by a conversation I had a while ago with my best friend. We were talking about all the things you need to remember when hosting a party, and how if you don’t do it often, or haven’t done it in a while, it’s easy to forget some of that stuff, even the simplest things can get overlooked. 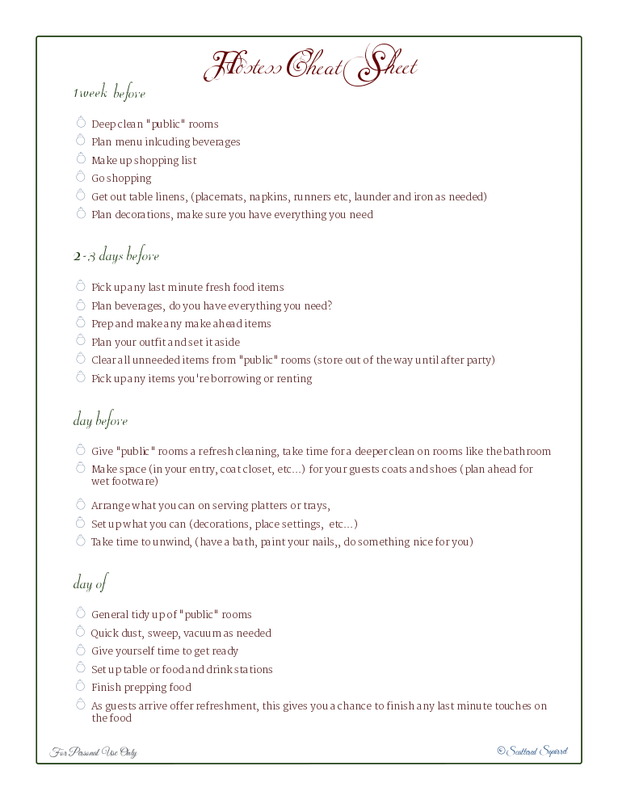 While we’re not planning any parties, as yet, I don’t want to find myself unprepared, so I whipped up a Hostess Cheat Sheet, to remind me of all the little things I might forget about. This one is pretty simple. I usually start a week out from the party date, so I wrote down everything I would need to do and sort of broke up into increments that I felt were manageable. Hopefully this will help keep holiday get togethers and parties more stress free! And there you have it, the last of the printables for the Holiday Planner (I think… you’ll be the first to know if there’s more!) I will be back on Friday with pictures of the finished product, and I’m inviting everyone to link up their own holiday posts, anything holiday related is welcome! Can’t wait to see you there! Are you ready for the holidays? Have you started decorating all ready? What are you most looking forward to this holiday season?